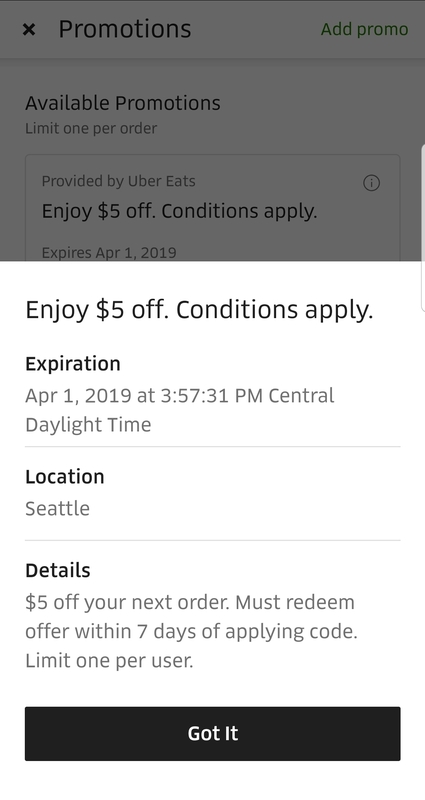 Deal has expired, view more UberEats promo codes by clicking here. Reposting as THEYSNOOZEUEATS1, THEYSNOOZEUEATS2, THEYSNOOZEUEATS3, THEYSNOOZEUEATS5 also work. (see also this comment). In some markets, you may see the offer show up as available to save within the app. Looks like this might be available nationwide (?). Able to apply the code to my account in Atlanta, but the discount is not applied to orders. Atlanta here. Applied to account but cannot apply to order. Was able to add but the Coupon’s T&Cs say it’s valid in Seattle. I’m in Midwest. Doubt it’ll work for me. Valid for 7 days from the moment the code is applied/entered. Look at other comments, working in areas other than seattle. $5 free and you still curse it? Nice attitude. Nobody is forcing you to use it. I bet you’re a millennial. The new fee structure is actually cheaper for me. Don’t like Uber? Same actually. But if you have platinum uber credits your forced to use it. That’s how they show on my account as well. THEYSNOOZEUEATS5 is the nationwide version.